B&B Palazzolo is only 500m from the central La Foce Villa, on the road that leads to Chiarentana. The house is one of the farmhouses rebuilt by Antonio Origo in the 1930s, designed to hold a large farmer’s family with many animals and fruitful fields. It faces the Amiata mountain, with all the Orcia valley below – a wonderful, sunny, open view. Protected on the north side by the hill and an imposing pine wood, it is the perfect place to enjoy the sun, especially in winter. So many guests have fallen in love with it (opened just 3 years ago) that La Foce started thinking how to satisfy requests for shorter stays. They finally decided to carry out a major renovating project involving the addition of three double rooms and four bathrooms and the convertion of the former stables into a large and comfortable dining and living room to accomodate the 14 guests. As from May 2016 B&B Palazzolo offers 7 rooms for bed and breakfast. The bedrooms are all very spacious and light, and each with an en-suite bathroom (both bath and shower). All rooms are painted in cheerful colours, often used here in the country. 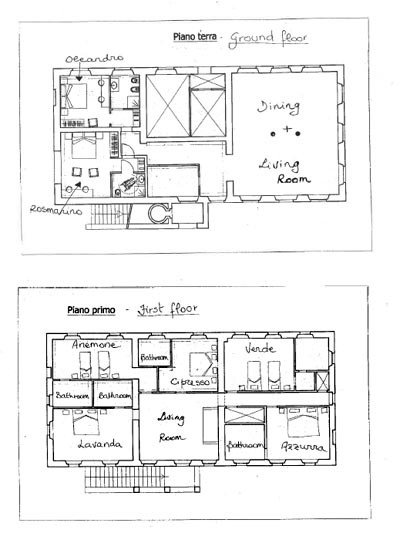 On the ground floor “Rosmarino” and “Oleandro”, both have a double bed. On the first floor “Azzura”, “Lavanda”, “Cipresso” equipped with a double bed and “Verde” and “Anemone” both can be made into twin beds or double beds. All 7 rooms have an en-suite bathroom. Guests with limited mobility may rent one of the rooms on the ground floor with a lovely view of the Valdorcia clay hills. There is a very large central room for common use, with an enormous farmhouse fireplace, sofas, armchairs, and TV. Complimentary WI-FI connection is available throughout the house. The breakfast is served in the dining room on the ground floor from 8:30am to 9:30am. Outside, trees – plum, cypress, mulberry – shade a long L-shaped table for outdoor dining, and a large flat lawn is perfect for reclining on deck-chairs or playing games (a croquet game is available, as well as raquets and balls). A lovely swimming-pool (mt. 10×4) overlooking the valley is at guests' disposal. The rates include heating, breakfast and daily cleaning. The whole house (for 14 people) can also be rented for a minimum stay of three nights at € 2.730, € 910 for every additional night. A long L-shaped table for outdoor dining, and a large flat lawn. Shared pool.